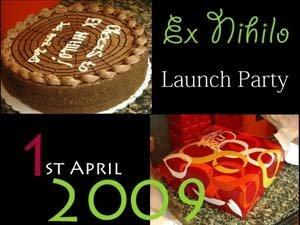 Ex Nihilo Magazine is an online magazine that was started in December 2006 as a bilingual online publication in English and Bengali for college students. Under the initial chief editorship of Sourya Deb, the small online magazine ran its first issue in January 2007 regrouping and resurfacing the following year. This online publication serves the student population of South Asia and the diaspora with its main focus on art, poetry, photography, and short stories. Under the current artistic leadership of Saptarshi Chakraborty (editor of photography), Sayantani Dasgupta (editor of art), and Debarshi Banerjee (‘Web Wizard’), Ex Nihilo Magazine ('ex nihilo' means ‘rising from nothing’) is now going strong on a monthly basis. One of the standout features is an interview of Marcus Rediker, who published the book The Slave Ship: A Human History in September 2007. The title provides a somewhat safe mislead on content, a darkly humorous abolitionist’s take on a shark’s perspective on why the slave trade should continue. This special feature of Rediker’s book makes the reader aware of the communal the effort to end slavery, as opposed to the long held notion that one man was responsible for bringing it to an end. Rediker also communicates the other long held notion that abolitionists were saintly people with the desire to do what was right and just. Another feature includes the photography of Jasmeen Prather, who convinced six heterosexual men, in Leicester, UK, to pose for photographs in womens’s clothing. The age ranges of these men were from seventeen to twenty-one and include one fifty-year-old as well. What may be more interesting than the fact that they agreed to this project is the possibility of the work being a topic for discussion of generational views on sexuality and levels of comfort. Provided that Ex Nihilo Magazine is still somewhat in its infancy, as far as consistency and content are concerned, the modes of artistic expression found in this publication are vast and original. It is refreshing to see the varied artistic expressions of those who may or may not exist alongside us, but whose culture is different enough to provide a varied, unique perspective that allows us to widen ours. The aesthetics of this online publication seem to still be finding an identity, but the uniqueness of the content is far from that search. Hopefully, its readers will continue to grow and contribute to this content.